CAPTAIN MARVEL #1  Soaring Higher Than Ever Before This Fall! New mission, same attitude. Suit up and strap in True Believer, because Carol Danvers is dialing it up a notch. Calling all Carol Corps members! Marvel is pleased to announce CAPTAIN MARVEL #1  a brand new ongoing series launching later this year! Marvels Agent Carter Executive Producers and Showrunners Michele Fazekas & Tara Butters make the jump to Marvel Comics to pen the explosive adventures of Earths Mightiest Hero alongside rising star artist Kris Anka (Uncanny X-Men)! Carols been from one end of the universe to the other, and through her journey shes discovered the hero and the leader she was born to be. Now shes back  and if you want to get to Earth, youve got to get through Captain Marvel first! Thats right, Earths highest flying, hardest punching heroine is the planets first line of defense against any and all extraterrestrial threats. With an entire fleet and a state of the art Space Station at her command, if you come here looking for trouble, you wont know what hit you! But when an abandoned ghost ship appears in our galaxy carrying mysterious cargo  does it spell doom for everything Carols built for herself? Hero. Pilot. Avenger. Leader. 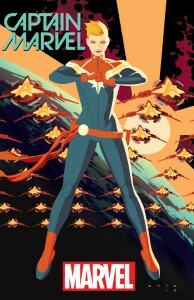 The next evolution of Carol Danvers begins this fall as she blasts off once again in CAPTAIN MARVEL #1!